What is best digital camera? Is it Canon, Nikon or Pentax? DSLR or Point & Shoot camera? It looks like difficult question, but answer can be very easy. Today It started heavy rain today when I was walking on the street. Didn’t have umbrella so jumped into closest store. It was book store. I was browsing between book stalls and one book caught my eyes. It was “The best camera is the one that’s with you“. 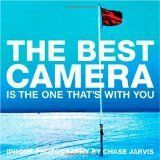 Thought book more dedicated to iPhone users, but main point – it doesn’t matter what kind of camera you have, how many megapixels it has. Just go and shoot. May be quality of picture done with phone camera won’t be the same as it could be done with DSLR, but it most cases the most important thing is the moment you catch, not the quality of it. I use a Sony Cybershot it is super slim and has a great automatic mode that detects landscape/faces/macro all I do is snap open the front and fire away, then back into the pocket he goes! Too easy 🙂 Dead cheap and doesn’t always get it right but it captures the moment and that’s all that matters! Nice post keep up the good work. Cybershot camera are great even when they built them into mobile phones they still gave a great picture.